A smidgen of sunshine could be beneficial for men's sperm. Australian researchers found that one-third of 794 men visiting an infertility clinic had a vitamin D deficiency. 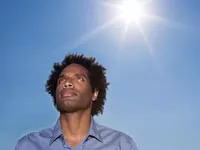 Since getting only 10–15 minutes of sunshine a day can boost vitamin D levels, 123 men tried to do just that—along with taking vitamins and living a healthier lifestyle in general. The payoff? A 75% drop in sperm fragmentation, a measure of damage. Overall, 31 men had partners who conceived after making the changes. As many as 58% of U.S. doctors use placebo treatments on their patients, a study suggests. They're not passing out sugar pills, however. Instead, doctors are prescribing painkillers, vitamins, or antibiotics that they think will make their patients feel better, rather than get better. The study, published in BMJ, largely confirms findings in a smaller study in Chicago from earlier this year. Coauthor Franklin G. Miller, director of the research ethics program at the National Institutes of Health (NIH), described the new findings as "disturbing." However, the doctors surveyed had a more cavalier attitude toward placebo use: 62% believed the practice was ethical. Apparently it’s no longer enough to sip your caffeine in a cup at breakfast time. Now you can get a jolt while soaping up in the shower or lathering lotion on your face, according to Time.com. A trend that started with energy drinks is steamrolling ahead, and 126 new caffeine-containing products have been introduced in the last five years. Some of them are quirky choices that don’t fit the late-night-cram-session profile—such as caffeinated oatmeal, sunflower seeds, potato chips, and jelly beans. Others are caffeine-containing soaps and lotions. Experts fear that absorbing caffeine from multiple sources may lead to an overdose, which can result in nervousness, insomnia, a racing heartbeat, and agitation.